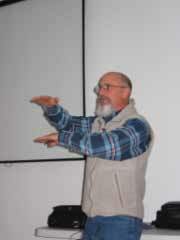 The seminar on January 23, 2009, featuring Dr. Fred Provenza of Utah State University on animal grazing behavior that was held in the new conference room at the Big Horn County weed and Pest Building was a huge success. There were just over 100 in attendance and Dr. Provenza kept everyone engaged for the day and we also enjoyed a great meal. I would first like to thank our sponsors Meeteetse Conservation District, South Big Horn Conservation District, Big Horn County Weed and Pest, Big Horn County Farm Bureau, and the Wyoming Chapter of Society for Range Mangement (SRM). There was a good cross section of ranchers and agency people who attended the event. It is difficult to summarize a whole day event such as this. I am going to draw some similarities between livestock and us as humans as did Fred Provenza. Fred referred to studies that had been done on cows that had been fed ammoniated straw. It was found that cows whos mothers were fed straw while the cow was actually a calf in its mother’s womb ate ammoniated straw better than those cows that mothers did not eat ammoniated straw while pregnant with that cow. As Dr. Provenza was talking about how calves are influenced while in the mothers womb, I was thinking about some close neighbors we had in Utah that had adopted children. Some of the children were drug dependant because their mothers were on drugs while pregnant with these children. He also talked about how they added maple and strawberry flavoring to ammoniated straw to get the cows to eat more and it was found that the cows like to have variety. It was found that cows that had been eating maple flavored straw preferred strawberry flavored straw and vise-versa. In one study that Fred referred to he sited that a study was set up to see if livestock can chose the kind of supplements that they need. It was found that cattle know what they need and seek out those supplements that they need if they are provided. Dr. Provenza also talk about how you may have seen cattle eat dirt or chew on bones the cattle are most likely deficient in phosphorus. I just recently tested five different stalks of hay near Meeteetse and all five stalks needed phosphorus supplement to meet the needs of pregnant cows. Fred also talked about how they have found ways to supplement sheep so they will eat more sage brush. Any producers wanting to know more about Dr. Provenza’s presentation can give me a call at the extension office. Dallen can be contacted at (307) 765-2868. The Conservation District also has available for loan a booklet published by Dr. Provenza and a DVD. Call (307) 765-2483 to borrow the booklet or the DVD. Click here to access the Fred Provenza website--this link will take you out of the South Big Horn Conservation District website, but please return soon!! Copyright © South Big Horn Conservation District. Site design by Paintrock Consulting Services.